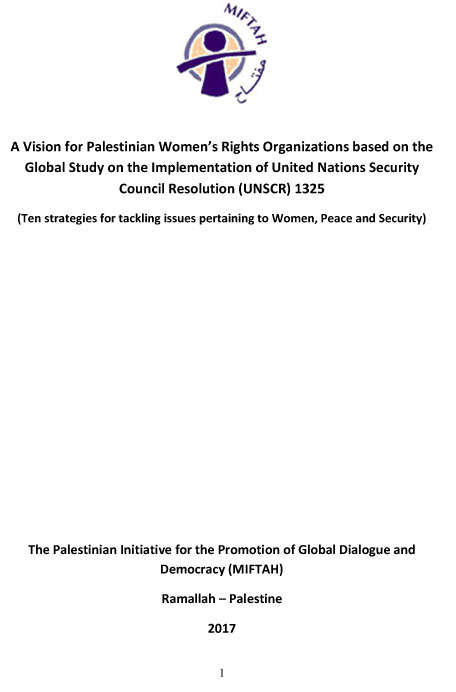 PNA (Palestinian National Authority, Wataniyya Al-Filastiniyya): The PNA was established through the Palestinian-Israeli Declaration of Principles on Interim Self Government (DoP) signed between the PLO and the Government of Israel on 13th September, 1993. Although the PNA is essentially an interim administrative organization that nominally governs parts of the West Bank and Gaza, it has the institutional character of a state, with a legislative arm (The Palestinian Legislative Council, or the PLC) and an executive (the Cabinet). There is also a nominally independent judiciary. According to the Oslo Accords, the Palestinian National Authority is designated to have control over both security-related and civilian issues in Palestinian urban areas (referred to as "Area A"), and only civilian control over Palestinian rural areas ("Area B"). The remainder of the territories (including illegal Israeli settlements, the Jordan Valley region, and illegal bypass roads constructed by Israel to link settlements) are to remain under exclusive Israeli control ("Area C"). In practical terms, Israel also retains control over the Territories' external security, air space, sea lanes and electromagnetic sphere. The President (rais) of the PNA: The president of the PNA is directly elected by Palestinians (who live in the Occupied Palestinian Territories), and the holder of this position is also considered to be the commander-in chief of the armed forces. In an amendment to the Basic Law approved in 2003 (and which may or may not become part of the Palestinian constitution once independence is established), the president appoints a prime minister who is also chief of the national security services. The prime minister chooses a cabinet of ministers and runs the government, reporting directly to the president. The current president of the PNA is Mahmoud Abbas, and his prime minister is Ahmed Qureia, who formed a new cabinet in February 2005. Palestinian Legislative Council (PLC): The PLC is the legislative arm of the PNA, and is a fully elected unicameral body comprising (currently) 88 representatives. The PLC is responsible for approving all government cabinet positions proposed by the prime minister, and must also confirm the prime minister himself upon nomination by the president. The PLC is directly elected on a multimember constituency basis, and its member are meant to serve for five years (although elections have been held only once, in January 1996). 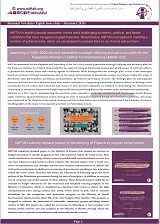 Major changes were recently made to Palestinian Electoral Law, when the PLC ratified Elections Law No. 9 on 18th June 2005. Those changes include an increase in the number of PLC seats from 88 to 132 and the introduction of a mixed electoral system by which 50% of seats are elected through the Majority System (districts) and the other 50% of seats are elected through the Proportional Representation System (Lists). Palestinian Judiciary: The Ramallah Appeal and High Court is the only court of appeal in the northern West Bank, and it also hears cases for the High Court, while Magistrates Courts and Courts of First Instance deal with other judicial matters. Israeli occupation policies, including crippling restrictions of movement and wresting away of PNA control over the Territories, have severely affected the running of the Palestinian judicial system (which requires the presence of three justices, a prosecutor, a defence lawyer and a clerk for trials to be legal). In August 2005, senior Palestinian judges held a two-day strike to protest ongoing lawlessness in Gaza and a spate of attacks on members of the judiciary. The Palestinian judiciary remains weak and insufficiently independent of the executive. The PLO: Established in 1964 and led by Yasser Arafat since 1969, the PLO has traditionally been the primary body of Palestinian nationalism, as well as the internationally recognized representative of the Palestinian people and the formal representative in all peace talks. While the PLO may speak with one political voice, it is composed of many individual groups. The Fatah party has always dominated, but many other parties and groups with widely differing political philosophies are also members. These groups include the Popular Front for the Liberation of Palestine (PFLP) (two factions); the Democratic Front for the Liberation of Palestine (DFLP) (two factions); the Palestine Liberation Front (PLF); Al Saiqa Organization; the Arab Liberation Front (AlF); the Palestinian Democratic Union (Fida); and the Palestinian People’s Party (PPP). (Note, the main Palestinian Islamist groups are not members of the PLO). Despite the differing political philosophies of these groups (which concern primarily attitudes towards Israel, Oslo, the role of religion in the state, and the role of armed struggle in the national liberation effort), most of their members are refugees whose main demand for decades, despite differences of opinion as to means and methods, has been to return to their homes and lands in erstwhile Palestine. 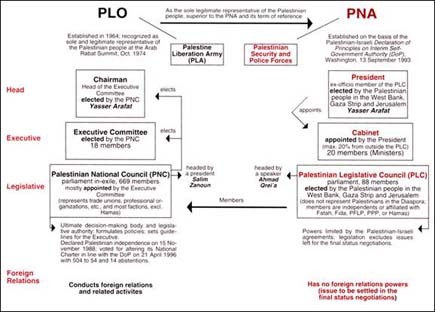 Seats on the PLO’s various decision making bodies, including the Executive Committeee (EC), the 200 member Central Council (CC), and the larger Palestine National Council (PNC), are shared by these different groups (see diagram above for structure of PLO and relationship to PNA). The Chairman of the PLO: Pursuant to PLO by- laws, the PLO Chairmanis appointed by the EC rather than elected by the PNC. Upon Yasser Arafat’s death on November 11, 2004, Mahmoud Abbas (Abu Mazen), the EC’s Secretary since 1996, was unanimously chosen by its members to become the new Chairman. Sources: The International Crisis Group; Wikipedia; Palestinian National Authority Official Website (http://www.pna.gov.ps/index.asp); Economist Country Reports (Palestinian Territories, November 2005); Jane’s Defense Weekly.